This is an easy cache in the centre of Bath to bring you to the magnificent Abbey building. JUNE 2018 - retoration work may limit access to this answer so you may prefer not to seek this cache until the work is complete. The City of Bath is a wonderful location, loaded with history, beautiful architecture and quaint little shops. Bath was built by the Romans around its hot spring waters around 2,000 years ago. The Victorians re-discovered the Roman Baths and they have since been restored to a magnificent condition. The Saxons built a huge Abbey in the 800s which was the site for the Coronation of the first King of all England, Edgar, in 973. The Abbey was re-built in the 1400s and still shows the scars of the English civil war in the 1640s. These scars include musketball damage from target practice and even one Saint with no neck and a recarved head after the original head was shot off. Bath became popular again in the 1700s due to its "restorative waters", resulting in a massive building programme. All buildings were constructed in a similar style, in a similar stone, resulting in its beautiful architecture. The Royal Crescent, Pump Rooms, Theatre Royal and Assembley Rooms are particularly recommended. 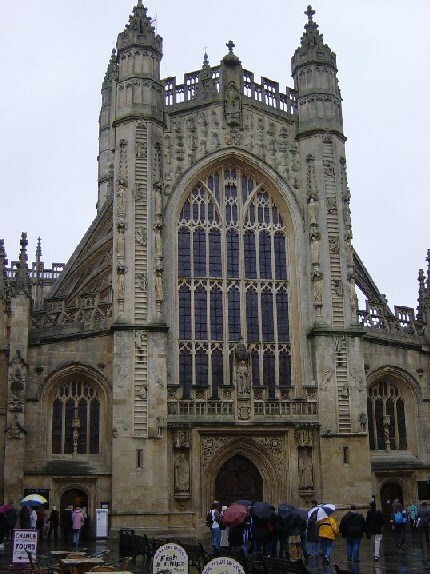 For details of the Bath Abbey and more information on the City of Bath visit this web site. When you visit this cache you will be adjacent to the starting point for the excellent (and free) Mayor's tours of Bath. These start outside the Pump Rooms at 10.30am and 2.00pm every day (except Christmas Day) and take about an hour walking through the streets. We've done it twice, they're excellent and much better than the tour buses. The start point is a sign at N51°22.871', W02°21.583'. Catch the street entertainers here too; they're often really good. 1. Take a photograph of Bath Abbey including your GPS in the photo (do not use a photo which includes the answer to the following question). 2. Find out the answer to this question: what is the text of a plaque which commemorates the coronation of King Edgar? Note that if there is builders hoarding (boards) obscuring the plaque then you can find the text regarding the first king which is on the hoarding next to the bus stop. 1. Send us your answer to the above question. To do this in the app then click “log” and then “send answers”, or in the website click the link for our name above “The Wombles” and then the link marked “Send message”. Type your answer, tick the box marked “I want to send my email address along with this message.” and then send email. 2. Now log your find. Don’t wait for an answer to your email. We will only contact you if your answer is wrong. 3. Ideally upload your picture. Once you have typed your log and clicked the link marked “log my find” then you will get a new page including your log and a link “upload image”. Follow the instructions and upload your photo. Under no circumstances should you post the answers in your log and DO NOT POST photographs of the answer. These logs will be deleted. These requirements are necessary because of the high numbers of armchair finders who do not physically visit the location. This requirement is effective as of September 2009. Gur cyndhr vf ba gur Noorl jnyy.